The TW-20 is a traditional flat panel door with a 1/4″ veneered center panel and cathedral arched top rail. 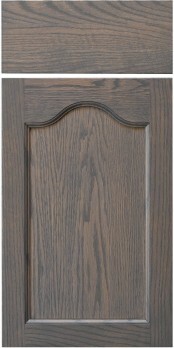 You can dress this door up by selecting an edge profile and framing bead. Please note for this door, panel raises are not available. The cross-section below shows how your door may look, but the edge and framing bead profiles you select will affect the final look of your door. Due to arched top rail, narrow doors can appear to have a ‘pointy’ top. Because this is a flat panel door, the issue is not as pronounced as on the raised panel cousin (CRP-20), but care still must be taken in designing your kitchen to use as wide a door as you can, typically cabinets at least 12″ wide.